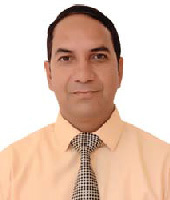 Prof (Dr.) Vinay Chauhan is the Dean (Planning & Development), Himachal Pradesh Technical University. He also holds the position of Professor, The Business School, University of Jammu. He comes with the teaching and research experience of over 16 years at PG level in university system. He has held several academic and administrative positions during his career like Chief Warden- Boys Hostel- JU, Deputy Coordinator (UGC-SAP DRS-II)-TBS JU, Convener, Publication Cell- JU, Editor of the Journal “Researcher” Journal of University of Jammu and UGC Nominee of SAP programme of Dibrugarh University, Assam. As a researcher he has 3 research projects funded by ICSSR & UGC, 03 books, 40 research papers besides being on the editorial board of several journals. He has guided eight research scholars at doctoral level. He is also member of the Board of Studies of several universities like University of Jammu, Central University of Himachal Pradesh, Central University of Jammu, Cluster University of Jammu etc. His career options right from the beginning have essentially been focused on opportunities that emanate from academics so as to contribute towards developing a conducive academic environment for value based education, wherein each stakeholder is expected to synergize their efforts towards developing systems and implementation of processes that are geared towards recomposing the institutions’ role in fulfilling wishes, needs and aspirations of the wider society that further act as a pathway for nation building. As Dean(P&D), we at HPTU, intends to thrive for greater recognition of HPTU both nationally and internationally. The primary role of the P&D office is to support and provide expertise related to the planning and development to fulfill the HPTU’s mission i.e. value creation and welfare of society through technical education training, research, innovation and entrepreneurial development. In fulfilling this role, we are responsible for strategic planning in coordination with all stakeholders, for synergizing a creative platform in setting the yearly strategic operational plans in collaboration with all the schools and affiliated colleges. In doing so, the office monitors the planning and policy formulation, plan execution by initiating periodic progress reports and performance measurement on key performance indicators. The Current areas of focus include; Strategic Planning, University internal & external operations, Accreditations and Quality Audits, Effective Governance, Resource allocations, campus development for creating and maintaining a safe and welcoming environment for students, staff, faculty and researchers.